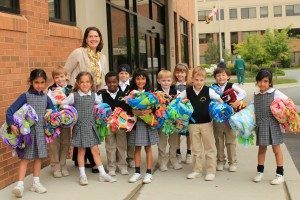 Our goal for all of our students is to expose them to a variety of volunteer opportunities within the D.C. metropolitan area beyond the walls of St. John’s Episcopal School and Church. In addition, we provide a variety of opportunities within the school throughout the year. It is our desire that volunteering within our own community is not just to fulfill a requirement but will develop a sense pride and inclusion. Grade 5 6 hours all may be earned at St. John’s but they may be earned outside our community too. Grade 6 8 hours 4 may be earned at St. John’s and 4 outside our community of school and church. Grade 7 10 hours 3 hours may be earned at St. John’s the remaining 7 outside our community. Grade 8 12 hours 2 hours may be earned at St. John’s and the remainder outside our community. Rainbow Place – providing shelter for homeless women during the winter months – open Nov. 1-March 31 7pm to 7am. Manna Food Center – Manna Food Center, a nonprofit organization, strives to eliminate hunger in Montgomery County through food distribution, education, and advocacy. Food Collections – Olney HELP seeks assistance from a group to arrange food collections and stock pantries. This opportunity is great for a small group of 3-10 people. Contact Deborah Hanson at 301-537-4213 or email c10kidmom@aol.com. Visit their website for more information: http://www.olneyhelp.org. Great for groups!